Editors Note: The Georgia Dugout Preview Magazine's weekly news and notes highlights the week's superlatives across the state. It is dependent on coaches submitting their top performances each week by 6 p.m. on Saturday. A trio of coaches recorded milestone coaching victories last week. North Gwinnett’s Ryan Moity notched his 100th career victory when the Bulldogs defeated Discovery Friday night. Meanwhile, Union Grove coach Allen Franklin notched his 200th career victory in a 12-1 victory over Eagles Landing Friday night. Discovery High School’s Jahleel Rivas-Dicks has made his mark as a freshman this year. The second-baseman has played strong defense, making an over-the-shoulder grab against North Gwinnett on March 15. Woodstock dropped two in a row to Walton in Region 4 play last week before rallying to defeat the Raiders 4-2 on March 16. Pitcher Zach McManus allowed just one earned run in six innings. He allowed just three hits and walked 12 in the victory. In the three games, Caleb Bartolero batted .625 with a double, a homer and five RBIs, while teammate Brennan Milone batted .500 with a homer and four RBIs. Milone also earned the save in the victory on March 16. In a three-game sweep of Alcovy from March 5-10, Evans High catcher Patrick Daniel went 7-for-10 with two doubles and five RBIs. Joshua Lanham went 4-for-7 with a double and scored seven runs. On the mound, Lanham went seven innings and struck out four. Wayne County's Ford Townsend had a big performance in the Jackets' 7-5 victory over Brunswick on March 16. Trailing by four runs, Townsend smacked a two-run homer to cut the deficit in half. Then later in the game, he earned a walk with the bases loaded to break the 5-all tie. But he wasn't done there. Townsend came in relief and struck out 11 straight batters to earn the victory on the mound. Greater Atlanta Christian rebounded last week with three big Region 7 victories over Dawson County. Sophomore left-handed pitcher Jake Johnson tossed a complete-game shutout (7 IP, no runs, seven strikeouts) in a 2-0 victory over Dawson on March 12. In the three-game stretch, the Spartans were led at the plate by Virginia Tech signee Carson Taylor (6-for-10, two doubles, a homer, three RBIs) and Trent Harris (5-for-10, triple, five RBIs). Ringgold has surged to the top of the Georgia Dugout Preview Magazine rankings after an impressive week that included a 6-2 victory over previous No. 4 Calhoun as well as a 10-0 victory over Lakeview-Fort Oglethorpe and an 11-2 victory over Adairsville. The Tigers’ Holden Tucker tossed a six-inning perfect game against LFO in a 10-0 win on March 15. The junior struck out 14. He also went 5-for-11 at the plate with two RBIs in the three-game stretch. 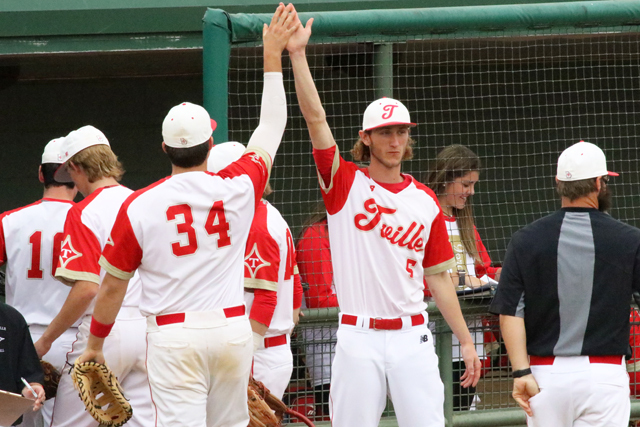 Other strong offensive performances during the week by the Tigers included Gavin Hollis (3-for-10), Ty Jones (3-for-9, three RBIs), Andre Tarver (6-for-13, two homers, four RBIs), Daulton Schley (5-for-9, four RBIs, one homer), Wyatt Tennant (3-for-6) and Brayden Broome who provided a grand slam during the week. Nathan Camp earned the victory on the mound against Calhoun, allowing two unearned runs in six innings while striking out five. He also went 5-for-12 with four RBIs on offense during the week. Bowdon won three games last week (two over Christian Heritage and one over Mt. Zion-Carrollton). Braden Bowen went 6-for-10 at the plate with a pair of doubles, a homer and six RBIs. The Red Devils’ Hunter Braswell, Bowen and Jarrett Stephens combined to no-hit Christian Heritage March 16. Braswell worked four innings, while Bowen and Stephens worked an inning each. Pelham catcher Doug Curles continues his hot streak at the plate. Curles smashed a grand slam and finished with five RBIs in a 14-2 win over Terrell County. Second-baseman Noah Russ went 3-for-3 with four RBIs in a 16-1 victory over Webster County. Wheeler County continues to make positive strides under coach Gary Beasley. The Bulldogs picked up two key Region 3 wins last week beating Portal and Claxton. Freshmen Noah Mitchell and Cooper Hartley combined on a no-hitter against Portal. Meanwhile, Johnathan Brown pitched an eight-inning shutout with 11 strikeouts in a 1-0 victory over Claxton. Fellowship Christian cracked the Georgia Dugout Preview Magazine poll at No. 6. The Paladins are 12-2 after going 2-1 last week, which included a split with previous No. 1 Mount Paran Christian and previously No. 8 Kings Ridge Christian. Senior Kurtis Royalty earned the complete-game victory on the mound over Mount Paran Christian on March 12. Meanwhile, sophomore Preston Joye tossed six innings with six strikeouts in the victory over Kings Ridge Christian. Joye also smashed a leadoff homer in the victory over Mount Paran on March 12. Senior Tony Tarabicos had two doubles and two RBIs in the three-game stretch, while freshman Garrett Hauentstein finished 5-for-9 with two doubles and three RBIs. St. Francis players Kyle Bork, Bret Madren, Brooks Mitchell and Matthew Fezza did their best in a pair of Region 6 games against Kings Ridge Christian. The four players combined for 14 hits (five for extra bases) and 11 RBIs last week.